20 Oct News Release #64 – Here are the final results for the first ever Japanese Hawaii rankings “111-HAWAII AWARD”! 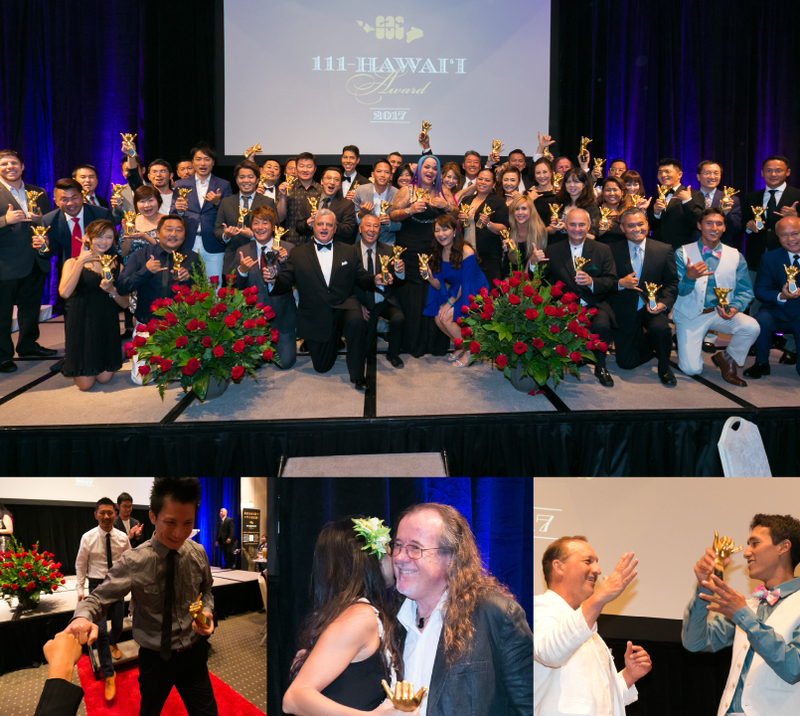 The top 3 of 50 categories were announced and received awards at the grand ceremony held at the Halekulani! Leonard's Bakery wins “Best of Shaka”, first place overall! Donation is also made to local nonprofit organization! 111-HAWAII AWARD (One-One-One Hawaii Award) is the organization operated by Hawaii nonprofit association JHTA (Japan Hawaii Travel Association) and 5 companies from Hawaii and Japan (Hawaii Hochi, Clarence Lee Design, TMS HAWAII, Shizuoka Shimbun Inc, Toms Co LTD) under the 111-HAWAII PROJECT concept, that is regional activities and social contribution activities in Hawaii. 111-HAWAII AWARD held an award ceremony at the HALEKULANI on Friday, Oct. 6th and announced the final results of the vote. 111-HAWAII AWARD is a Hawaii ranking by online voting. The top rankings from 50 categories, such as Hawaiian gourmet, souvenirs and tours, are chosen by Japanese Hawaii fans who live in Hawaii, Japan and anywhere in there world. Looking at some noteworthy rankings, for example, in the “Pancake” category, Boots & Kimo’s ranked second, but finished first after overtaking Eggs’n Things. In the “Garlic Shrimp“ category, the North Shore food truck Giovanni’s was ranked first place, in second place came Romy’s in Kahuku, and the third place was also a Kahuku food truck, Fumi’s. Garlic shrimp became a “North” battle. In the “Loco Moco“ category, Aloha Table overtook Rainbow Drive-In, which was first place at the midway point in the voting process, and won the first place. And there are a lot of other interesting results, such as Wolfgang’s Steakhouse in the “Steakhouse” category, Nico’s Pier 38 in the “Seafood” category. For more results, check out 111-HAWAII AWARD Homepage. Also, among the 50 categories, Leonard’s Bakery, popular in “Malasada”, was chosen as “Best of Shaka”, that is sent to the shops that gather the most votes among all categories. The award ceremony was held on the red carpet at the Halekulani. The final result was announced at the award ceremony held at the Hawaii luxury hotel Halekulani on Friday, October 6th. Representatives of winning companies dressed up in tuxedos and evening dresses and walked on the red carpet laid from the entrance. It was luxurious ceremony just like the Academy Awards. The ceremony opened with greetings by the chairman of Japan Hawaii Travel Association, Akio Hoshino, who is also the host of this grand award show. 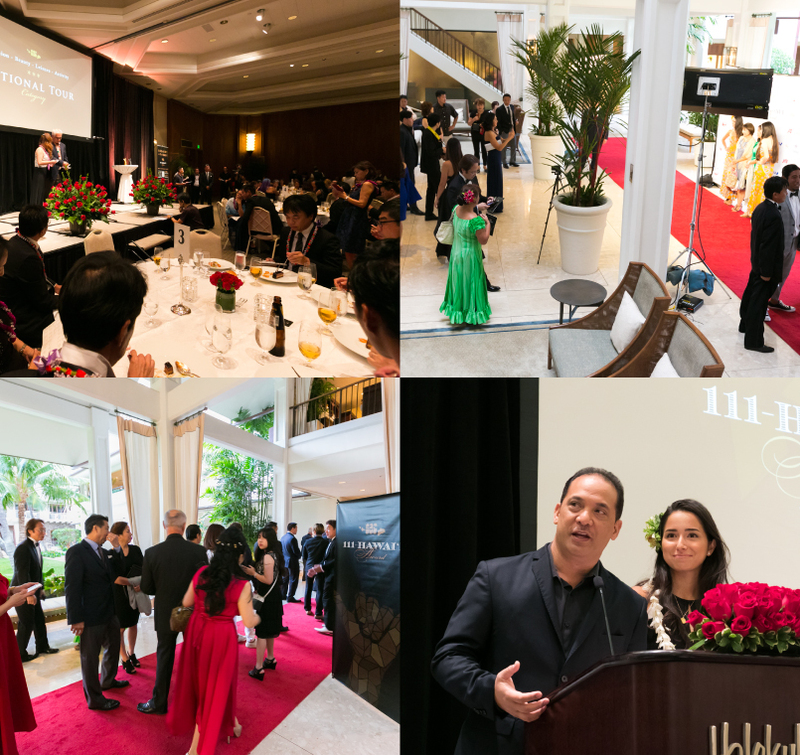 200 people, including the award-winning companies, Hawaii Tourism Japan, sponsors, and media, gathered at the venue. Participants were delighted to have this rare and wonderful exchange opportunity. The desire of this award to encourage Hawaiian community came to fruition. Each company that won 1st place in their category was presented a Golden Shaka trophy. The golden shaka trophy was shone on the red carpet. The Black Shaka trophy was presented to Leonard’s Bakery, which received the largest number of votes among all nominees. It was an awesome trophy as the best of Shaka. 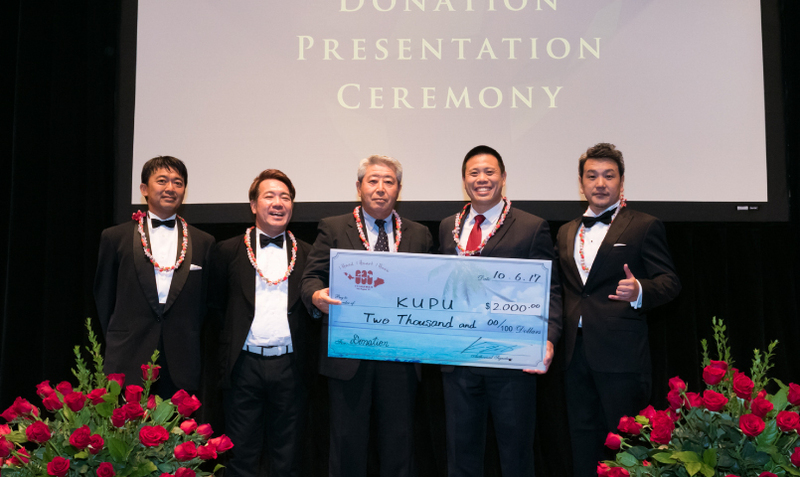 The representative of the nonprofit organization “KUPU”, which provides activities to protect Hawaii’s natural environment, came to the venue on that day. A donation of $2,000, determined by the number of votes, was presented by 111-HAWAII AWARD. The activity that Japanese’s vote is utilized in the activities of nature protection in Hawaii was realized here. Check out 111-HAWAII AWARD on Facebook to see more about the award ceremony and photos. Japanese people are known to be some of the world’s most demanding when it comes to quality. By awarding Hawaii’s businesses from such Japanese voters’ strict view point, Hawaii’s product and service quality will increase, which will lead to contributing to developing local industry. Hawaii will gain higher satisfaction through better service from these awarded excellent businesses. Also, by creating a user-interactive voting system, Hawaii fans as well as Hawaii consumers will increase. By Hawaii related Japanese media joining forces and distributing better information about Hawaii, Hawaii’s local business and brand value will increase, thus leading to local revitalization.